This is where I do most of my work... recording, mixing, video editing and teaching. These were taken a couple of year's back but the studio still looks the same, albeit not quite as neat. I'll have to dismantle it, including the acoustic panels, and reinstall it in Jozi in the new year. Looks great. I like that your acoustic panels have the same speaker cloth as your monitor speakers. 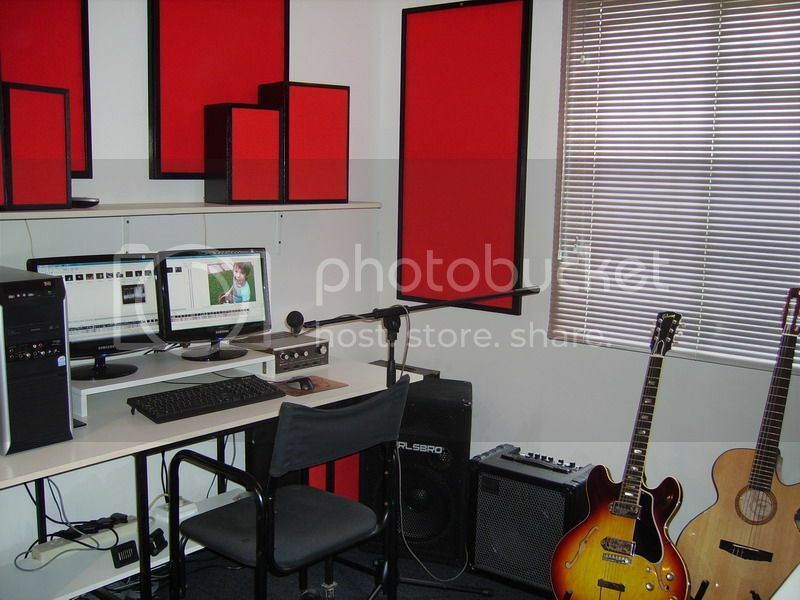 PeteM wrote: These were taken a couple of year's back but the studio still looks the same, albeit not quite as neat. Ah, the "lived-in" look. A room doesn't feel comfy to me unless there's some clutter. My new room is just getting there. At least it all looks like it's modular. 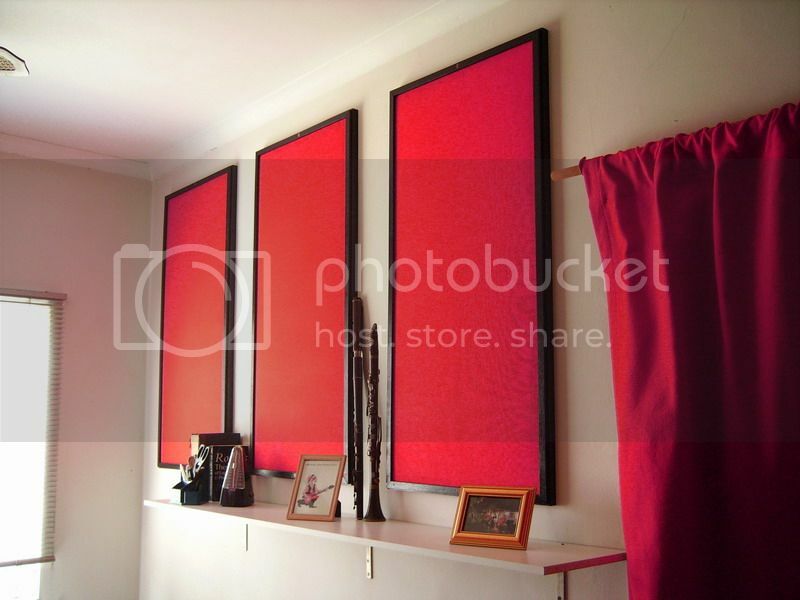 How are the panels attached to the walls? Actually, do you mind if I make this sticky and we open it to everyone to post their studio space? I've been meaning to get a sticky thread going for that. @Alan. The panels are screwed onto the wall. 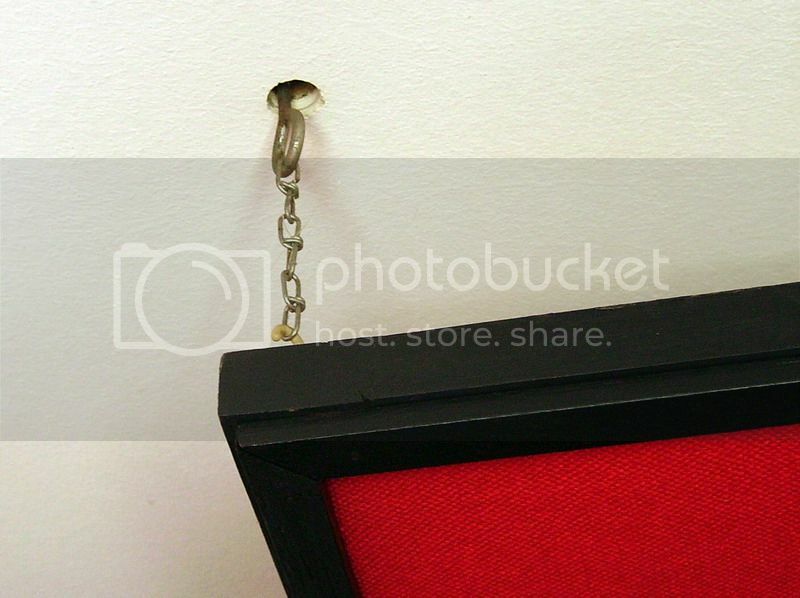 I simply unscrew them and make good on the wall like a picture hook. I also have two panels suspended from the ceiling. I'll take a pick of that later today... it might be interesting to some. A sticky is a great idea. Awesome Pete. The studio looks really neat (as in cool!! ) ..... Love your colour matching. 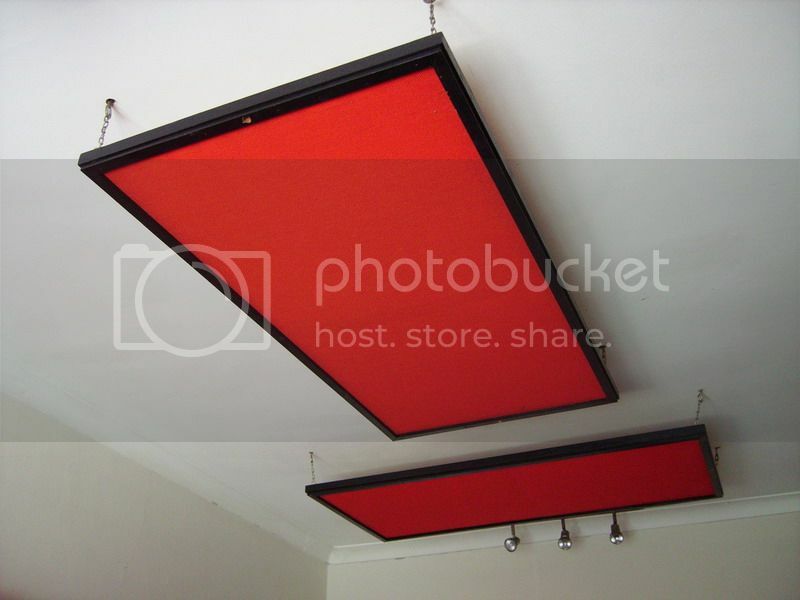 PeteM wrote: I also have two panels suspended from the ceiling. "Clouds" - I have some planned for my studio too. I've taken some more pics for my archives and thought I may as well share them here. These are the "clouds"... suspended acoustic panels to break up the ceiling. And this how I attached them. The panels on the opposite side of the monitors. The panels would have been too heavy for the door hinges of the cupboard so I tacked on some carpet. From the desk to the rear. There are seven (ugly) cupboards (4 on rear wall and another three up the side wall) filled with boxes, cases, cables and stands, etc..
-Acoustic panels to the side (4) and front walls (2). All 1200mm x 600 x 100, floated 50mm from surfaces. -Bass traps filling both front corners from floor to ceiling (superchunk traps). -1 - 2 clouds, 1200mm x 1500mm with LED downlights built in. -Single-pane front picture window, 8.7mm thick Soundprufe glass. Double pane not needed (and kind of pointless because of the tin roof). Possibly similar for the side window, but also toying with the idea of trying glassbricks there. - heavier door. 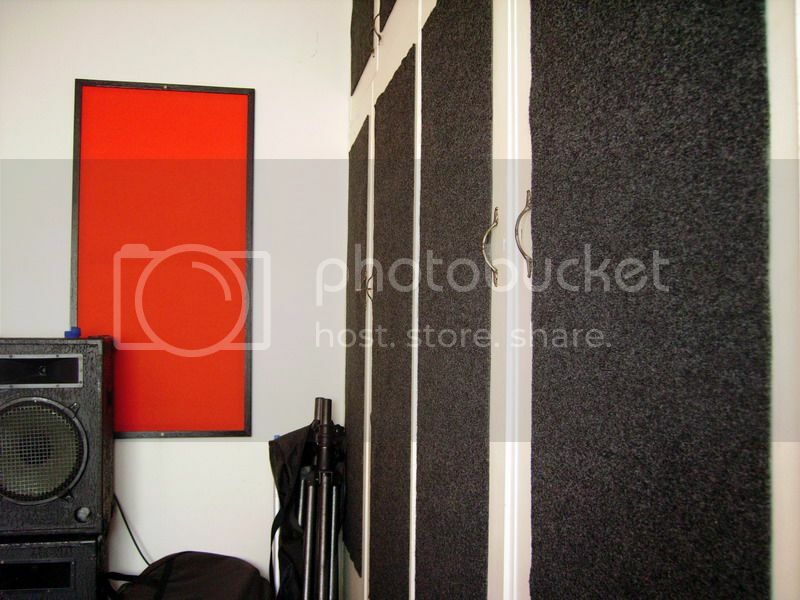 Full soundproofing not needed as noise in or out isn't really a problem. - Roof/ceiling. Heaven knows. I'll need to do something, but haven't decided yet. Will probably go for HD ceiling and insulation. The roof itself will wait a few years, until we need to reroof. PeteM wrote: I've taken some more pics for my archives and thought I may as well share them here. Great - your panels look similar to what I am planning - wooden frames with 4" thick fibreglass (47.5kg/m3) and material facing and wood trim. I used rockwool. Do you think there is a market for these? I would be able to make them to custom sizes and fabric trim. Your studio is looking good Alan. A nice big room... but also means more acoustic treatment hey! I also have a tin roof and I installed Onduline on top of the iron. This, plus fibre glass in the ceiling, reduced rain noise extremely well. 1) Is that dean's body really that small?? I thought they were ES335 sized ??? PeteM wrote: I used rockwool. I considered it, but fibreglass is just that much more efficient for the same thickness. Do you think there is a market for these? I would be able to make them to custom sizes and fabric trim. Not really, no. There are a number of companies and quite a few individuals doing them and no-one is really making a fortune from them. Thing is, when people start looking at them, they discover that they can make them themselves. The only real advantage you can offer over a DIY one is a professional looking product (e.g. Genesis acoustics offer them with art or photo prints on the fabric). Yup, but far fewer problems with standing waves, which tend to be the real issue. I also have a tin roof and I installed Onduline on top of the iron. Thanks - Looking into it now. Looks like a great alternative to zinc - waterproof, lightweight and higher STCs. I'll probably install straight to joists though, to avoid the possibility of creating a triple-leaf system between ceiling, zinc and Onduline. I'm also looking into Magnesium Oxide (MgO) ceiling boards, which seem to offer performance double the conventional gypsum boards for the same thickness. Fortunately, it's a quiet area, so I don't have to go too nuts. Basically I have to stop the noise of my neighbour's sheep. Chocklit_Thunda wrote: 1) Is that dean's body really that small?? I thought they were ES335 sized ??? Just fractionally wider than an LP. More like an ES339. ES335s are too big for me - I'm only little. Yup, and thankfully, no, he doesn't join in, but will often sit on my drumming feet or rest his chin on my arms while I'm trying to play in an attempt to get attention. I love the look of that Dean. I'd also seriously like to hear it with them there Magnatrons! Any chance of a closer pic of the dean? Even if you have to put it in a more relevant thread? Wow Pete, Nice!! :applause: Even the carpets on the closet doors look classy! 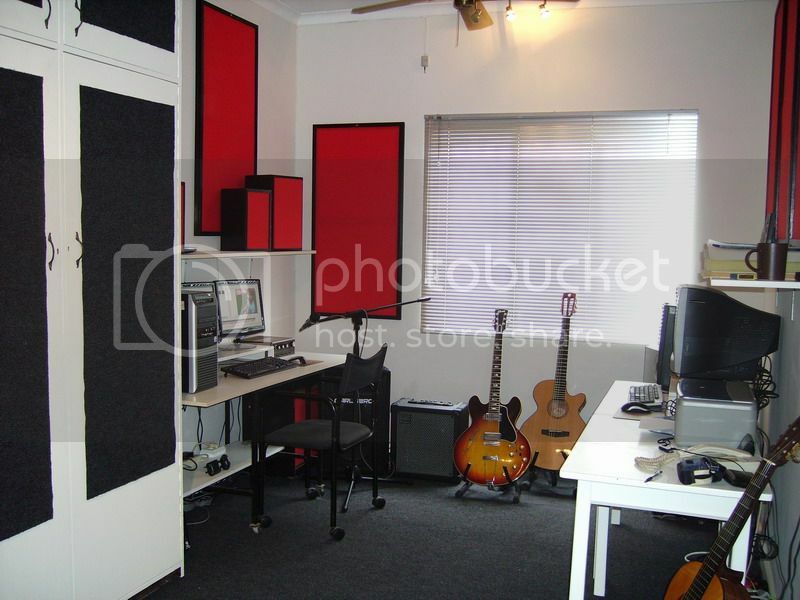 No more space on the walls for guitars - the rest of the space is for acoustic treatments. @Alan: Persian carpets! No guitarist is complete without at least one. P.S. : Just change the name of the thread to "Your Studio"
No more guitars for me before I sell off a few again - and the ones I have that are actually worth selling are the ones I least want to let go. Why are you all so keen to sell the Ricky though? Not a good player or is the tone a bit of an acquired taste? Pity. Rics rarely show up secondhand. Especially here. I know he's also interested in trading for a Gibson tho. Why are you all so keen to sell the Ricky though? Wasn't keen, it sounds amazing (and nothing else sounds like a Ric), but I play huge necks and the Rics are anything but fat. So I didn't play it often and I've learned to be completely ruthless - If I don't play it much and wouldn't gig it, it goes in favour of something that I will use. My wife was saddened by it going - she loves the sound of Rics.